That code gets you 20% off our in-stock production toys. We have nearly 200 different items in that category. You can see them all here. Jump on this fast, as the code expires at midnight tonight! Feel free to spread the code around on Twitter, Facebook, etc. This second part of the project will feature the return of the Kings Of Atlantis in Glyos action figure form! I will also finally reveal all of the Kings' powers with this release. 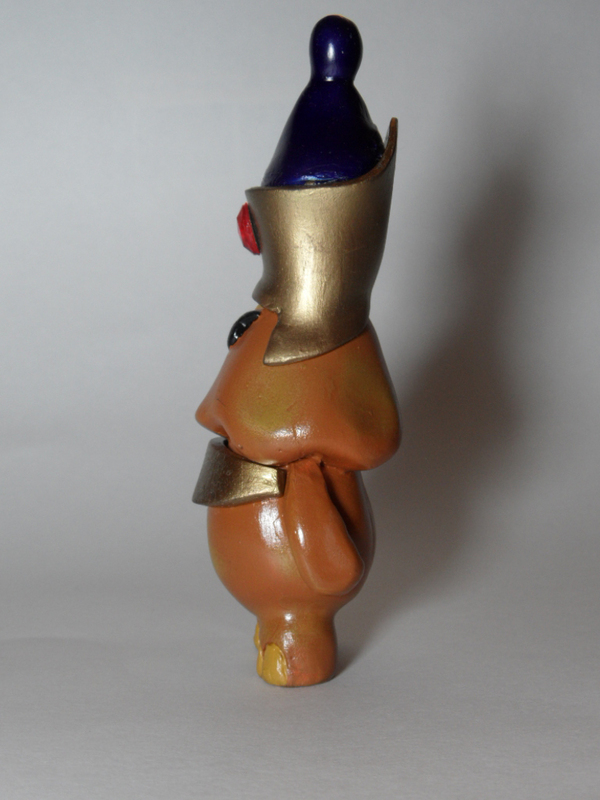 As with the Tuttz Glyos we teased earlier, the talented Victor Durango will be handling the paint work. As we near completion on this project, everything will be fully revealed by Matt Doughty [of Onell Design] with all images of assortments and pricing. Onell Design is the company behind the Glyos system of customizable action figures. All of their pieces and parts are interchangeable, giving you an infinite number of different ways you can customize their figures: accessories, heads, limbs, colors... an infinite number of combinations is possible. 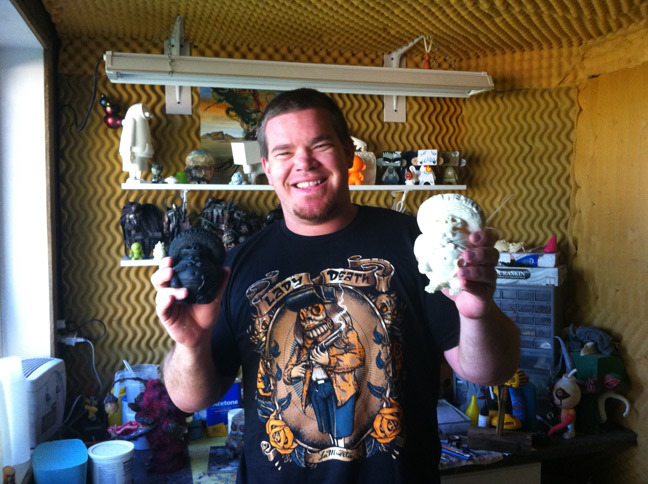 Argonaut Resins is one of the premier resin figure companies working today. 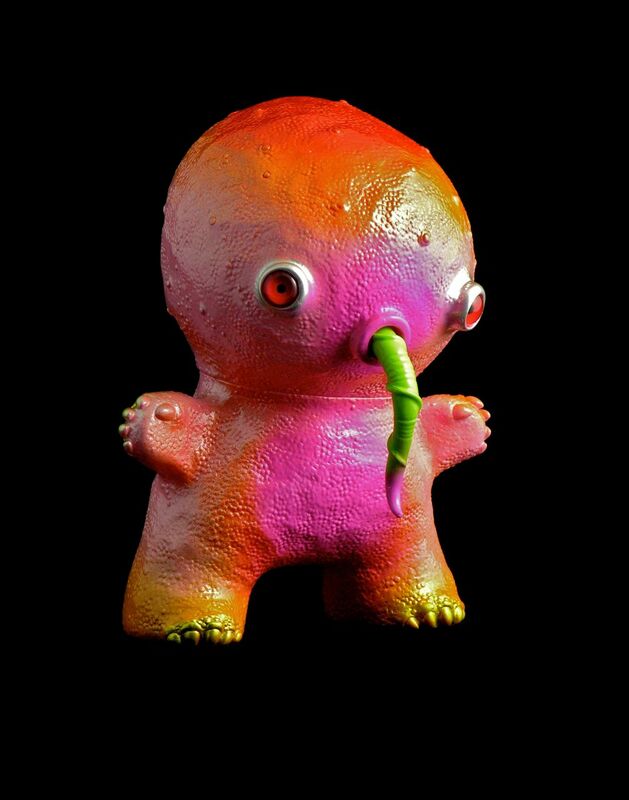 Operating out of Hoboken, NJ, Argonaut has a number of incredibly successful resin figure releases under their belts, not the least of which is their always-sold-out Tuttz series. 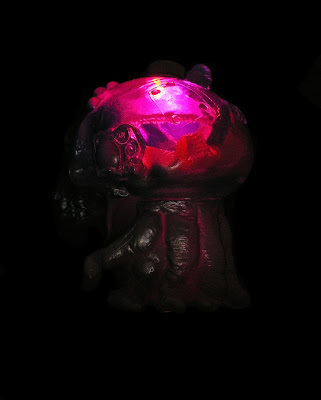 This collaboration between the Onell and Argonaut has Argonaut pouring resin heads and accessories compatible with the Glyos system. 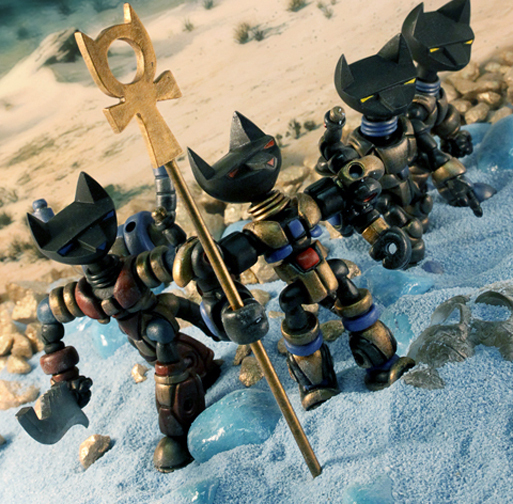 This allows the Argonaut characters to take on new life as action figures! 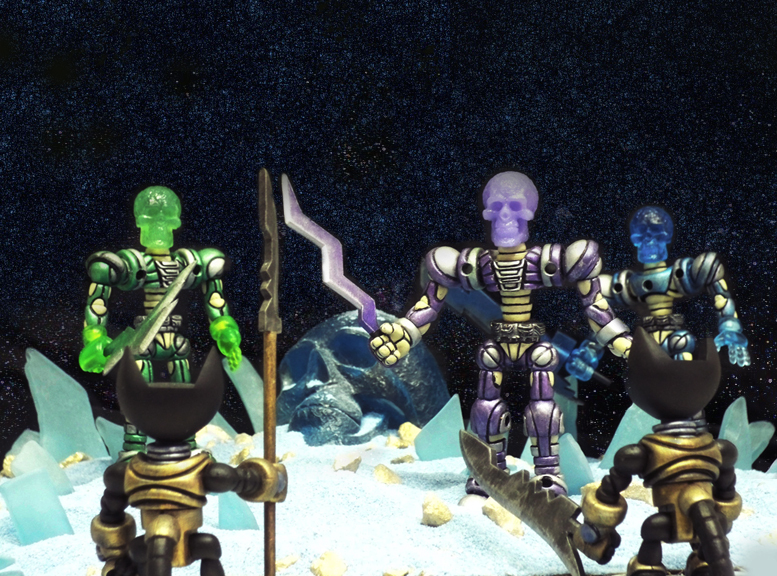 The Tuttz cats and the King of Atlantis skulls take on added dimensions as they transition into articulated action figures. This is a case of the end product becoming more than the sum of its parts: two universes smashing together to form the genesis of an entirely new collaborative product line! 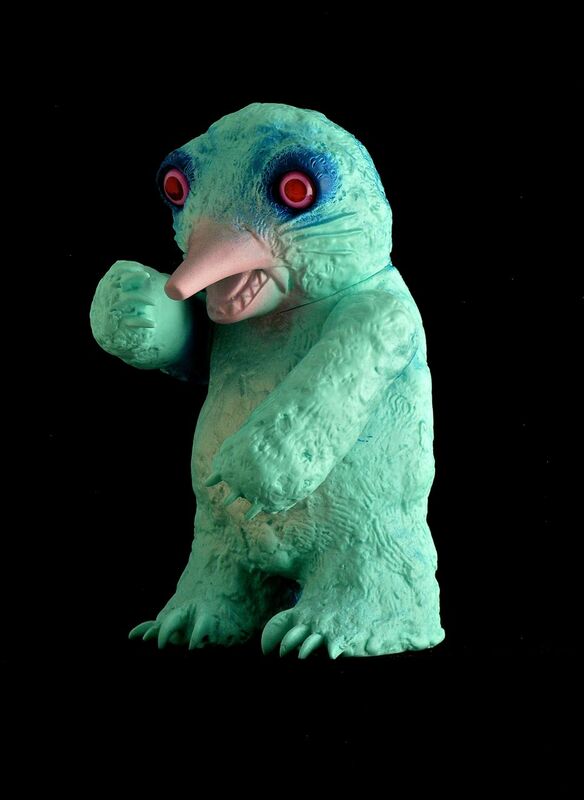 Above is the beautiful "Tenacious blue" NYCC Exclusive Molezilla, painted up for us by Bob Conge of Plaseebo for our NYCC booth. 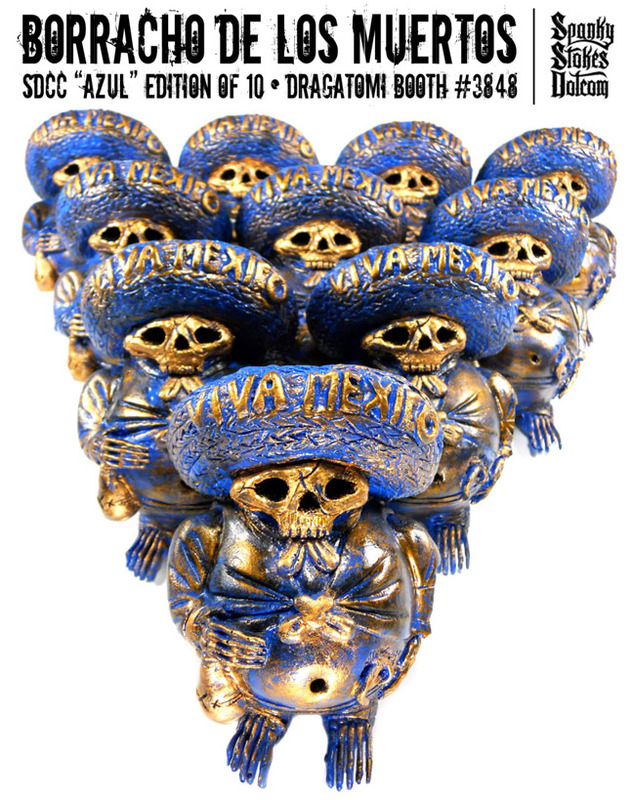 Price will be $100 even, and there are only 5 of them, so get to booth 876 early! We have Bob signing in a group signing along with fellow toy warlords Mike "NEMO" Mendez and Rob "OsirisOrion" Ingellis at 3PM on Saturday October 15th. Not coincidentally, we'll also be selling a selection of Monster Kolor paints, hosting customs by Matt Walker of Monster Kolor, and we will have some giveaways of MK paint from time to time at our booth! Better just plant yourself at booth 876 and stay there. Matt Walker will be there in person! 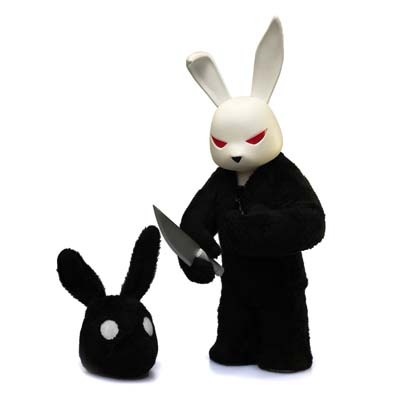 Customizer JCRivera will be on hand at our NYCC booth (#876) that we're splitting with Toy2R. He'll be signing at 11AM on Saturday October 15th, right before Jon-Paul Kaiser. JC sent us 3 Mini Qees and 3 Fatcaps- pretty unique style he has going on here, with a lot of detail in each piece. You can inspect for yourself at NYCC! 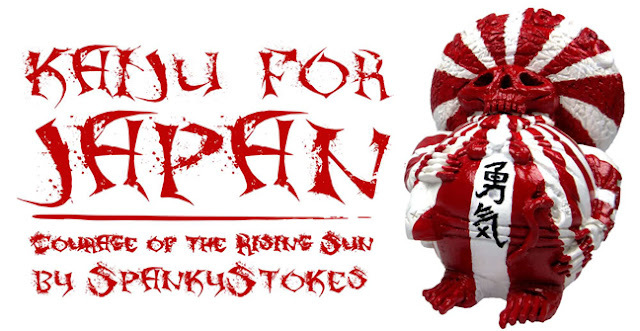 Tenacious Toys: So Spanky, most of us know you as one of the hardest-working bloggers in the art toy world. I, for one, read your blog frequently to see what new toys are coming out. But your Borracho de los Muertos figures took me by surprise: when did you move from customizing vinyl toys to pouring your own resin? interpretations I will leave up to the viewer. TT: So your family goes down to Baja frequently? You must have been a young'un when you got the original figure! 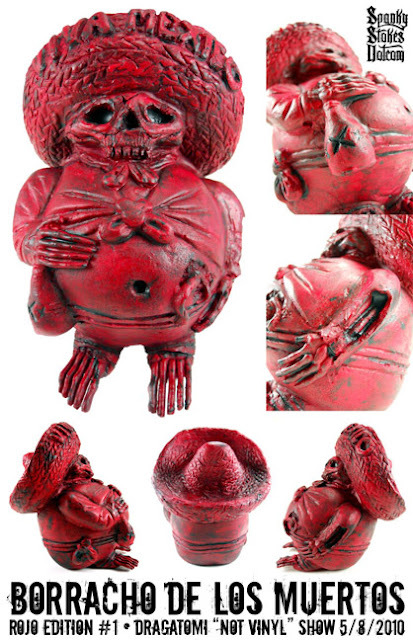 picked this original figure up, on the boardwalk in San Felipe. TT: That's so cool! It sounds like a lot of fun... I've never been to Baja but I've shot plenty of rifles- riflery was my varsity sport in high school! So basically you took an existing figure and re-worked the concept to make it your own. Did you do your re-working in clay or some medium like that, in order to develop the prototype for the mold? And did you do that carving and re-imagining of your figure with your own hands, or did Dodgrr help you out with the sculpting? SS: Geek alert!!!! Hahaha honestly who does riflery in high school :-) Just bustin yer chops dude!!! 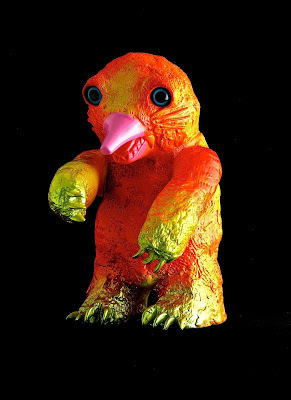 When I reworked the actual figure into what you see now I used a 2-part resin sculpting epoxy called Magic Sculpt. That stuff is awesome to work with and unlike the typical Sculpey material where you have to bake it to cure it, Magic Sculpt firms up chemically in about 5 hours... the downside is that your working time is a little rushed so you really have to have a vision for what you are working on, and be able to execute that vision before it dries! I also used some plastic skeleton parts that I had lying around for the hands and feet... they just so happened to fit the figures shape and size perfectly and with little modification. As for doing it myself, yes 100% of the sculpting was done by me... the reason I brought Dodgrr into the mix was for his expertise in making molds and casting! 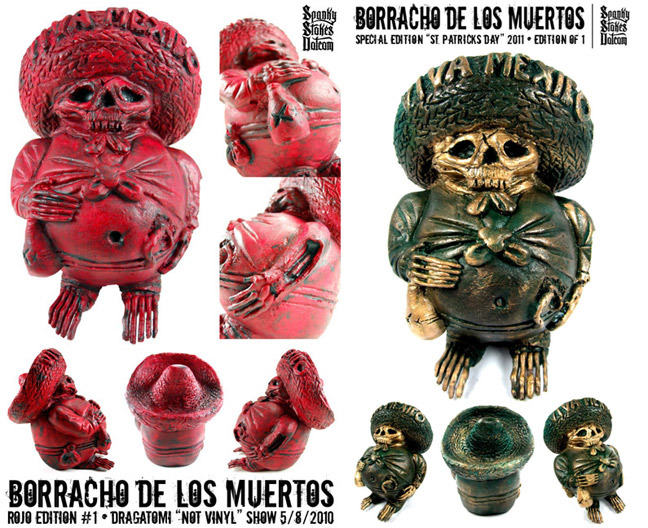 TT: So to date you've released 30 Borrachos in various colorways. 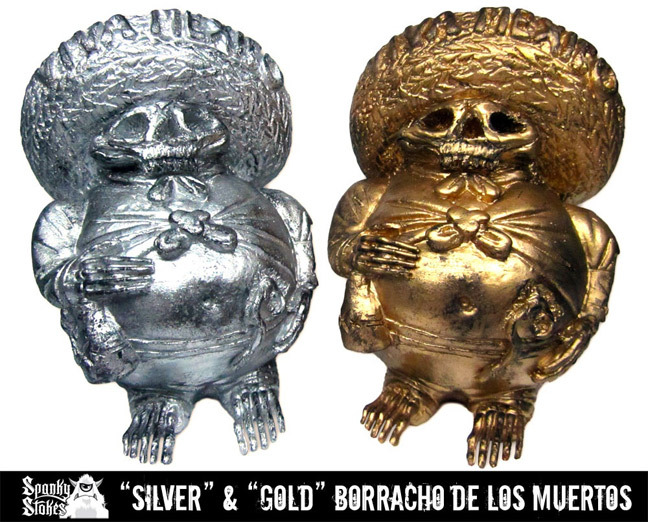 Can collectors still purchase any Borrachos anywhere? How many different colorways have you made public? And, do you plan on making more? 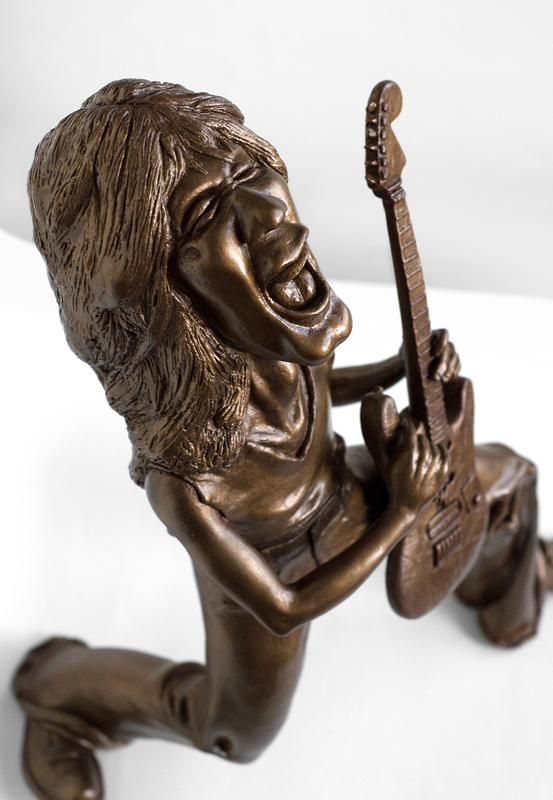 What's the next step for you as an artist after you retire this sculpt? SS: I would say around 30, give or take have been released. Either for shows, for friends, for giveaways... now that I think about it... there are probably more like 50 of em out there as I had to make a second mold because the first one bit the dust! As for purchasing them... there are none available yet, but I will have a handful available at your booth during NYCC in an exclusive blue pearlescent colorway (way to set up the plug) hahaha! Most of the time when it comes to colorways I would just do one-offs... 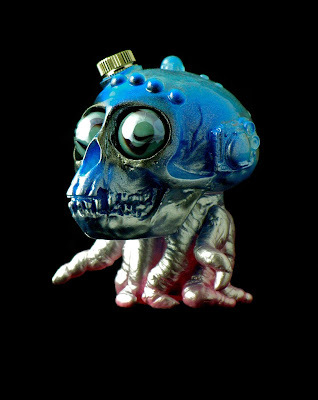 I think the only time I did a run of one particular color was for SDCC 2010 with my "Azul" series (below). Once these guys have run their course, I want to do another sculpt for sure, maybe a 100% original this go around instead of using a previously existing platform. Scratch that... I do have a few available HERE at the Rendition Gallery site. 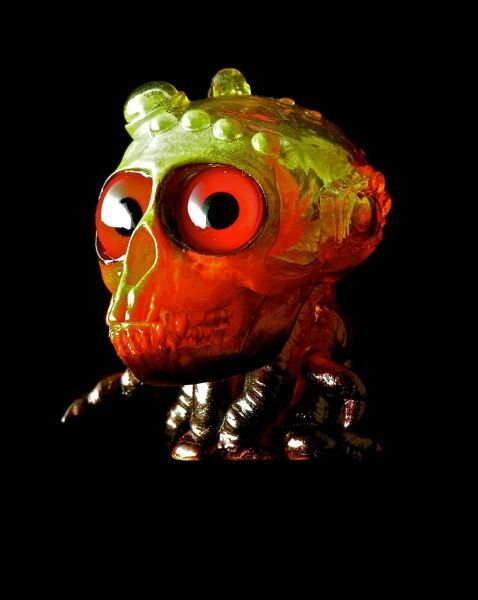 TT: So I take it you dig resin toys! I was a vinyl-toy-only kind of collector until I met END from Argonaut Resins and saw the work he was doing. Now I can't get enough resin! 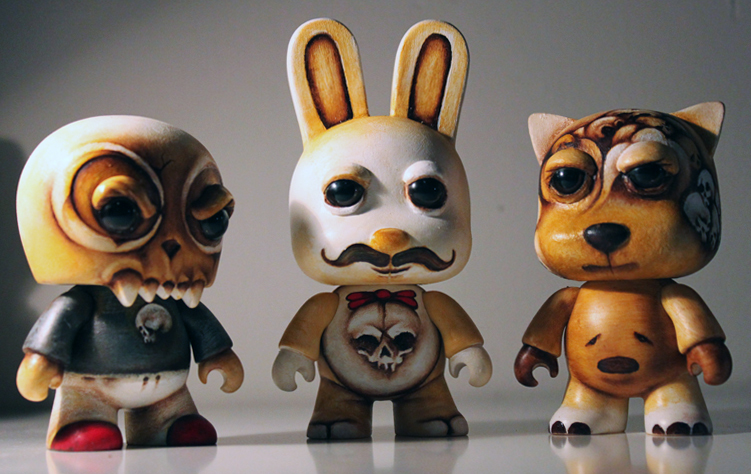 Where do you see resin going as a medium in our art toy world? What are your own personal preferences in terms of what you like to collect? I know you try to support everyone in this scene, as I do, so I'm not trying to get you to pick sides. I'm just interested in what types of pieces, what genres, excite you the most. You, out of everyone I know, probably see the highest number of toys every day. Do you ever see resin toys overtaking vinyl as a material for designer toys? And, do you have any resin toys in your own collection? 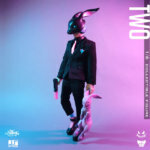 TT: Spanky, thanks so much for taking the time for this interview! Looking forward to meeting you at the con! SS: Yeah man, thanks for taking the time to squeeze this interview into your already crazy schedule and I can't wait to hang at the convention! 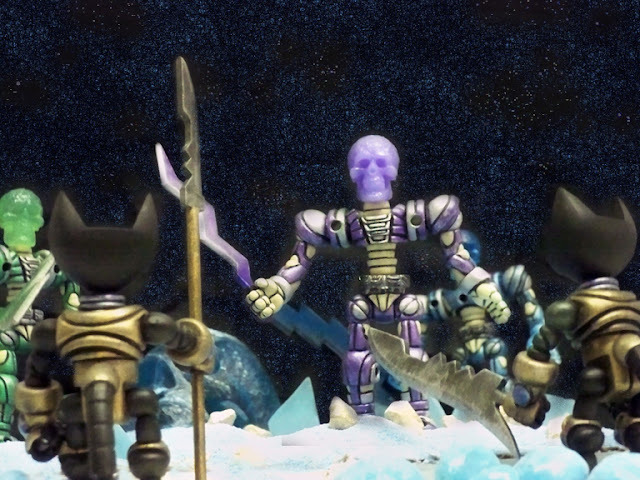 My man Danicus Prime is churning out toys under his own label, Toy Dungeon Studios. King Sputtz is one of his first resin characters, measuring 3 inches tall (without the crown). 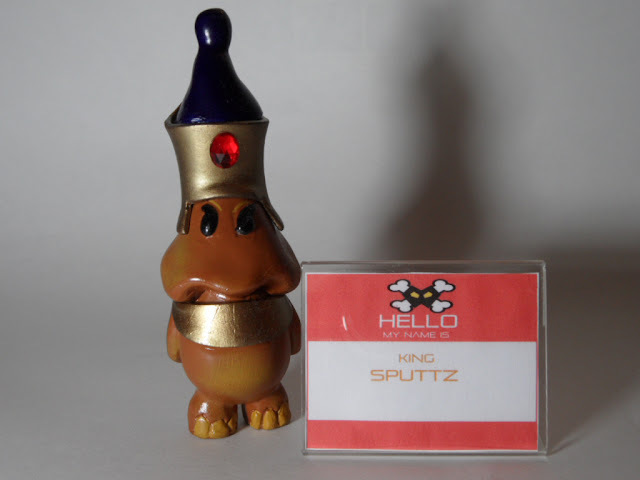 King Sputtz, The nemesis to King Sproggy. 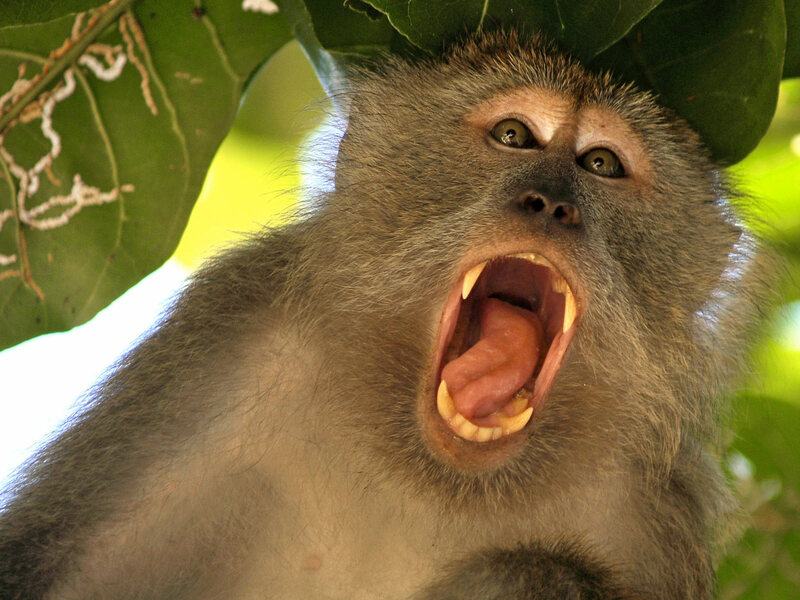 This Pharaoh rules the lower parts of their Moon-World: Oam-Peltu. And is quite hell-bent on over throwing King Sproggy their true and rightful ruler. 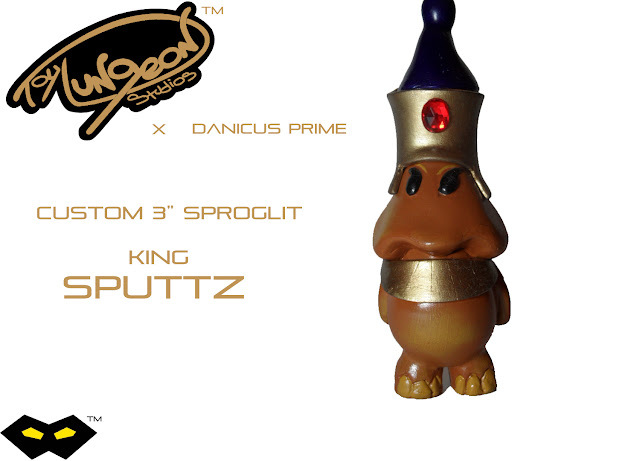 King Sputtz comes complete with crown and Jewel of The Moon. This piece was specifically made for Toy Dungeon Studios. Jared Flynn of Room 909 will be at Booth #780 along with Titanum Toys and Alpha Godz in The Cultyard at this year's New York Comic-Con. Jared will be debuting his new resin piece "Edward St Hubbins" which comes in 2 colorways (above and below) and will sell for $275 each. This thing is MASSIVE at over 13 inches tall! Rock n roll for real. Edward is a monument to the rock gods that have blown out our ear drums and kept our neighbors up all night. This resin titan stands just over 13" tall. Each piece is cast and finished by hand and no two are completely alike. The finish is a real ground metal coating in a water based binder with layers of colored patina and a clear coat sealant. 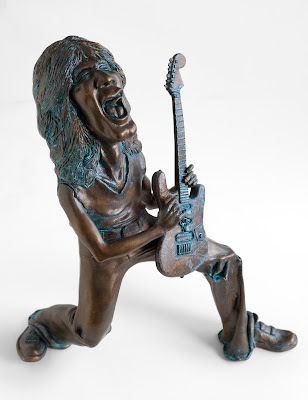 Sculpt by Jared Flynn. Molding and casting by Tony "Titanium" Montalvo of Alpha Godz Entertainment. Find out more by going to the Room 909 website, and visit them at booth 780 at NYCC! On October 14th, Shawn Wigs will be releasing his "Candy Licker" custom Dunnys, packed in a set with an original album of new songs by Wu Tang's Method Man + Shawn himself! There will be 100 sets for sale. 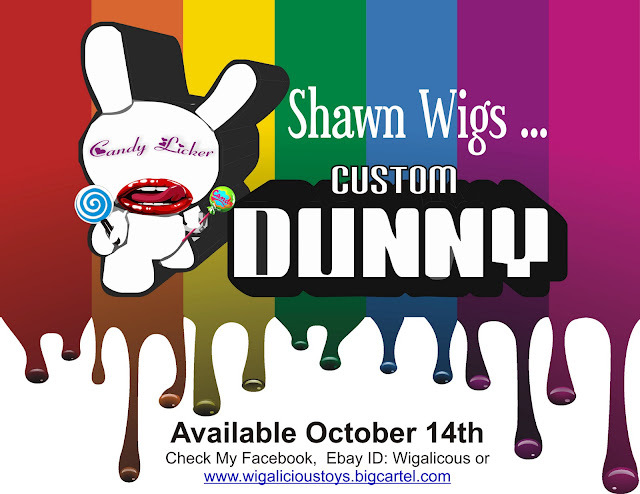 Shawn says the Dunnys will all be mostly the same, but a little different. I think he's keeping it deliberately vague. These sets will be available on Shawn's eBay page and on his BigCartel site. In the meantime, you can keep up with Shawn on Facebook.